Born 1841. Edu­cated privately and at London University. Commenced yachting in 1860 with a 2-tonner, and in the two following years owned 5 and 10 tonners respectively when quartered at Gibraltar and Malta. In 1895 Sir James owned a 1-rater by Payne, and next year chartered the Alarm, a 40-ton schooner, for the season. In 1897 he cruised in the Siesta, a 130-ton schooner, which was subsequently wrecked on the Scillies. Florinda was pur­chased and raced by Sir James during the two seasons of 1898 and 1899. 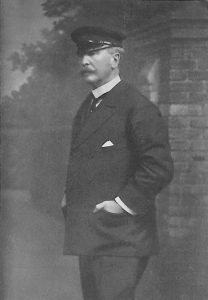 In 1900 he bought Brynhild, which he sold in 1906. Brynhild, Yawl. Built for Sir James Pender, Bart. Among the trophies which these boats have brought to Sir James are three King’s Cups, including the Coronation Cup, six German, four French, and six English. To their record may also be placed a long list of money prizes. 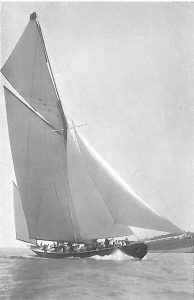 In 1906 Sir James bought the famous first-class cutter Kariad for racing, and in 1907 he built the first-class cutter Brynhild II. Clubs: Royal Yacht Squadron, Royal Dorset, Royal Corinthian, Royal Southampton, Royal Cinque Ports, Royal Cruising, and Royal Thames. Of the latter Sir James is Vice-Commodore. Residences: Donhead House, St. Andrews, Salisbury ; and 2, Mount Street, W.